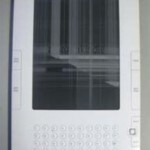 The screen on the Kindle can be damaged by medium to excessive force, when this happens parts of the eInk display will start to show strange looking horizontal and vertical lines, smudging of the image and/or mirroring. You can also remove the back cover and gently hit the reset button or removing and replace the battery. 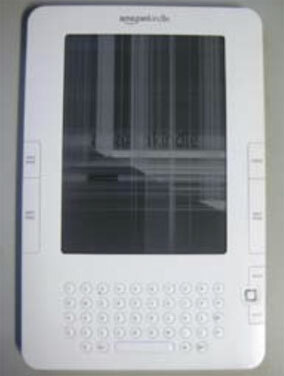 If things look the same after reseting your kindle then screen has probably been damaged. The bad news is that there is no way to fix this apart form swapping your unit out. The good news is that Amazon customer support is awesome and if you get in touch with them they will usually get a replacement out to you the same day. To get your Kindle fixed, you can access their support online however the best thing to do is to just call Amazon. Their customer support works 24/7 around the clock! To access Amazon customer support to replace a damaged Kindle you can click here. To reach Kindle Support via phone or e-mail, please click the Customer Service button in the Contact Us box in the right-hand column of this page. Contacting us through the Web site allows you to verify security before a call is placed and ensures we have your account information ready when we call you. You can also reach us by calling one of these numbers: Inside the United States: 1-866-321-8851, Outside the United States: 1-206-266-0927.